So, I have no idea if I'll be able to post this properly seeing as at the moment you're reading this we are in Saudi Arabia... 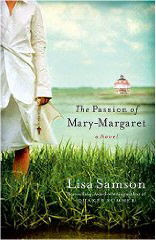 But I finished this book, The Passion of Mary-Margaret, last week, all 310 pages in under 3 days. It was that good. This is the second book I've read by Lisa Samson and I haven't even read the one she's most well known for, Quaker Summer. My reactions to this book... I'm keeping this one! It's told in a flashback style and has so many twists that I think I could probably read it a few more times and get more out of it each time. The flashback setting of the story takes place between about 1940 and 1960 with the "present time" being the years 2000 - 2002. It started out a little slow and you could see where it was going in some ways so I just kept waiting for it to "get there", but I don't think it would have had the richness if it was told any other way. It's an amazing story of this girl's devotion to Christ and the craziness it took her through. That being said, it was not an easy read. It deals with some of the social issues of that time (particularly racism) as well as things that are just as much a problem in our society today, if not more so (drugs and abuse). However it's done in a very straightforward manner, not as an attempt to shock the reader. I would NOT recommend this for teenagers, but highly recommend it to adults. 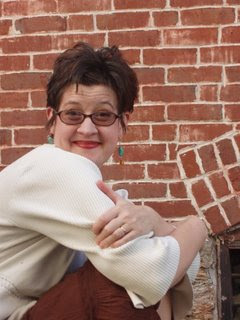 I am SO excited to find out that Lisa Samson has written another book! My mom and I are big fans of hers.